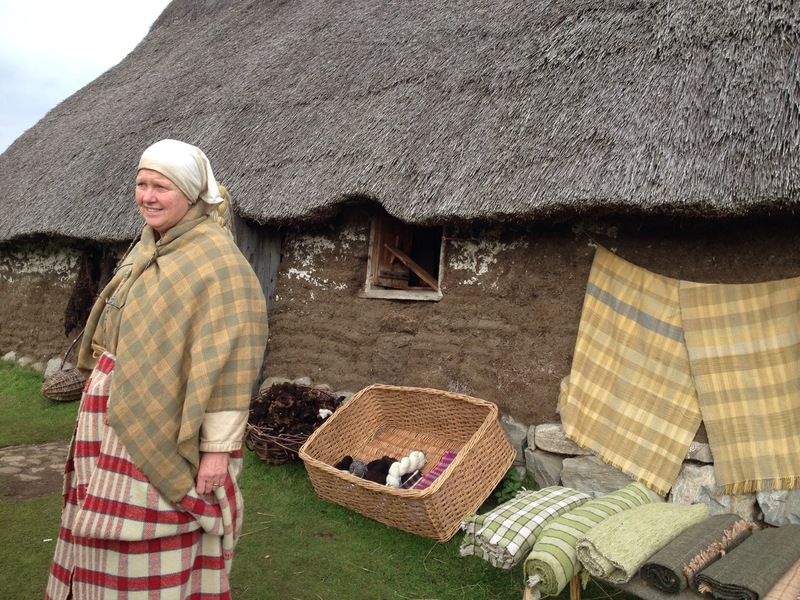 The Highland folk museum is my kind of museum, one with no endless corridors and stuffy rooms of glass cases. 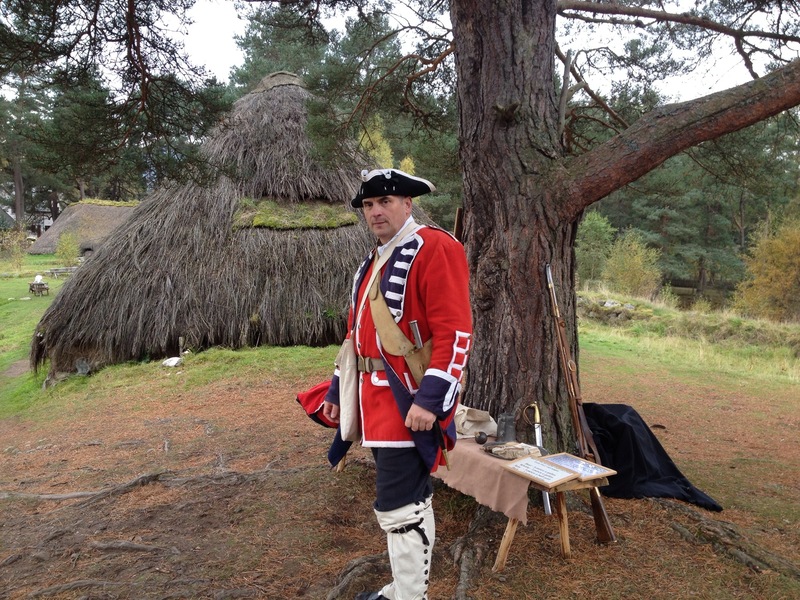 One where, instead of sullen guards reminding you not to touch/keep your kids under control/not to slide down the banister, there are knowledgeable interpreters, dressed up and in character, ready to enthuse children and adults alike in Highland history. 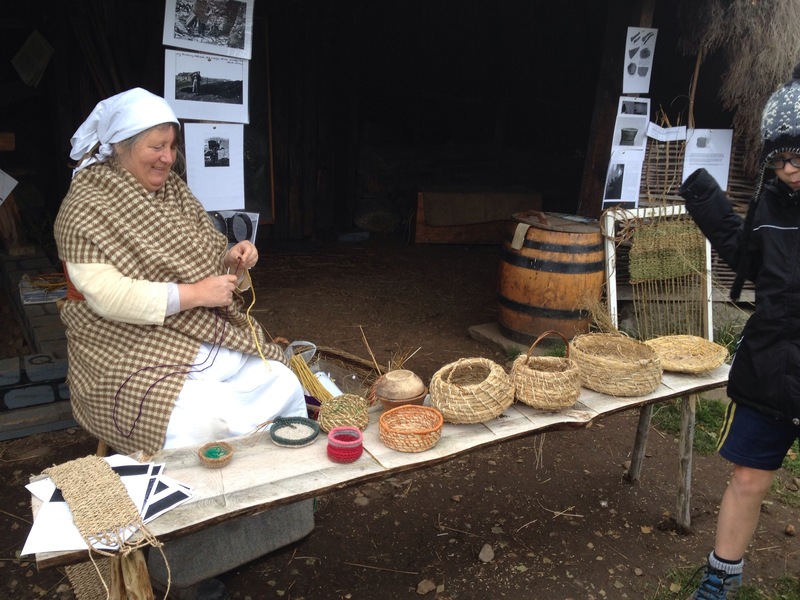 It is also an outdoor museum and laid out on a site a mile long with significant buildings, from curling hut and tailors, to railway halt and farmhouse reconstructed and relocated at the site. 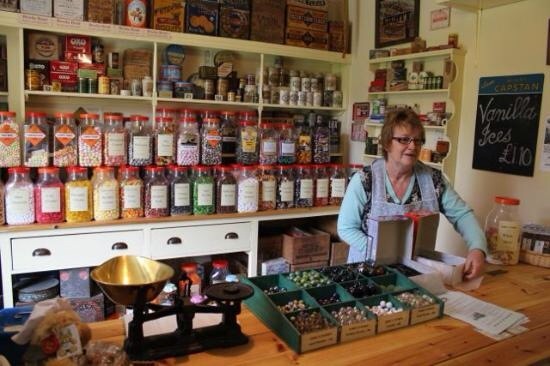 Kirks stores is a traditional shop with all the traditional sweeties: aniseed balls, soor plooms, barley sugar. And they sell them by the quarter. We always race here first. 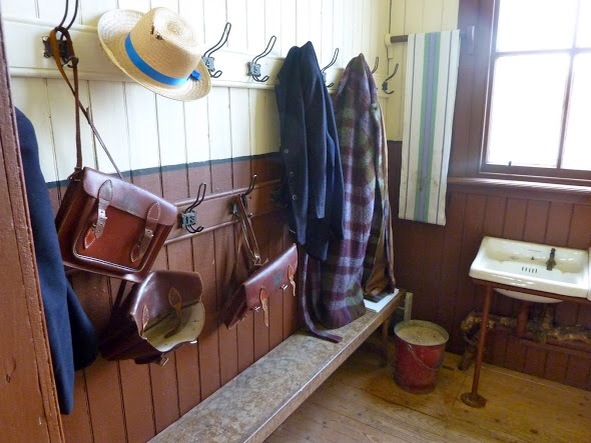 It’s near to the entrance but there must be something inherently attractive in a 1940s classroom with a teacher brandishing a leather strap who is only strict with the grownups and gives the kids good marks in their handwriting tests using pen and dipping ink. 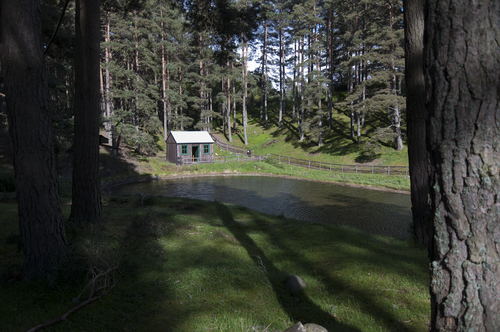 I’ve got a soft spot for curling huts (we happen to live opposite one in Glasgow) The woods are great for a picnic too – all Scots pines and blaeberry beneath. Against the council of the weaver we went to speak to the redcoat and regretted it when he tried to join the kids up to the kings army. An example of an early prefab. Built in the 1890s, apparently churches just like this were sent all over the empire. But it’s not so much the story of the kirk but the unaccompanied Gaelic singing playing inside that I go for. I could sit and listen and contemplate happily. But mainly I get dragged off to the cafe, shop and playpark. 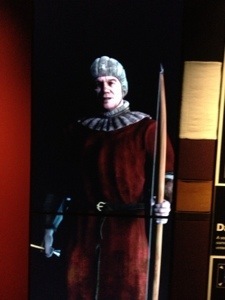 I can testify that the new Bannockburn visitor centre is a wonder to behold. It wasn’t until we were out if the exhibit and eating a large scone and jam in the cafe (great coffee) that I realised the significance of today’s date, 1st March 2014. 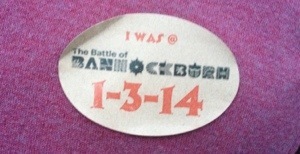 The opening day of the Bannockburn exhibition 1.3.14, 1314, the year the battle took place 700 years ago. The exhibition is in a brand new building which may look like a 1970s gym hall from the outside, built in grey brick with a flat roof. But it’s airy and light inside and the friendly staff told me that the shiny black tiles on the roofs surrounding the inside courtyard were designed to look like the chain mail of the battlefield. The exhibition is a fully imersive experience. You get issued with your 3D glasses at the start and enter, via a 3D audio visual introduction, into the main space where charging horses almost trample over you and you flinch back to avoid fighters in hand-to-hand combat. When Edward’s archers released a volley of arrows right over our heads to the ranks of spear-men across the room my daughter, standing near to the ranked schiltrons dropped to the floor in a perfectly executed death writhe. A steward wandered over to check she was OK.
A panorama of the screen around the sides of the room. You do feel the excitement of the battle but not the cold fear or horror of what was taking place at Bannockburn with thousands slaughtered on the Battlefield. So many, we learned later at the epilogue audio visual, that the bodies filled the burn and you could walk across without getting wet feet. 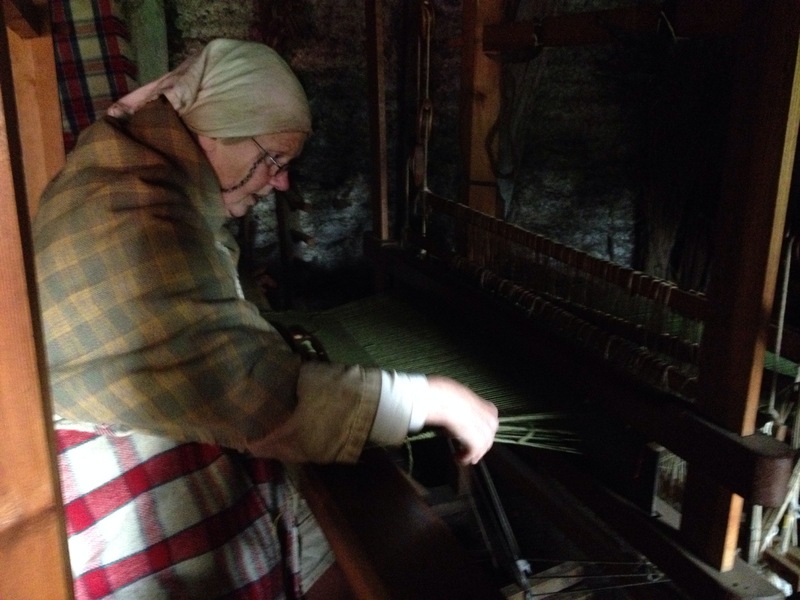 We had a chance to meet characters from both sides of the battle, from a farmer’s wife who joined the ranks of the wee folk who looked like reinforcements joining at the back of the ranks of Scots, an infantryman wearing just a padded vest for protection and The brother of Robert Bruce himself. 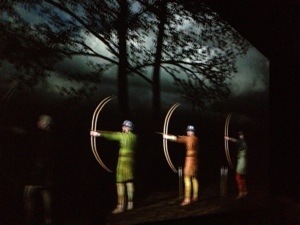 On the opposing side we met, among others, a Welsh archer, the most skilled archers of the time, a boy training to be a knight and a local woman acting as a spy for the English. At our appointed time we went to take part in the battle simulation. I admit to being slightly disappointed that this wasn’t fighting 3D avatars with real swords but instead we gathered round a model of the site and were allocated a battalion to command. We then took tuns to move battalions around the field and they engaged in battle. At the end, the English team had won, which evidently wasn’t supposed to happen. But I think that the participants were using their knowledge of the in advisability of camping in a bog to their advantage. It is a real triumph of technology and an amazing experience. 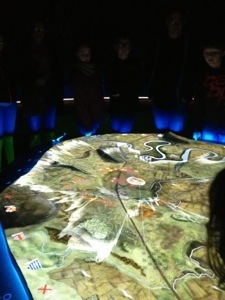 However there is a missed opportunity in linking the learning in the visitor centre with the battlefield itself. The acres of manicured green lawns seem an anomaly and there is no interpretation about the battle to help you see where everything happened. The poignancy of this as a grave of thousands of people is also missing. I would have loved a guided walk from one of the leather-clad crystal-maze-style battle leaders to show me where the armies were and explain to me what happened in the landscape itself. 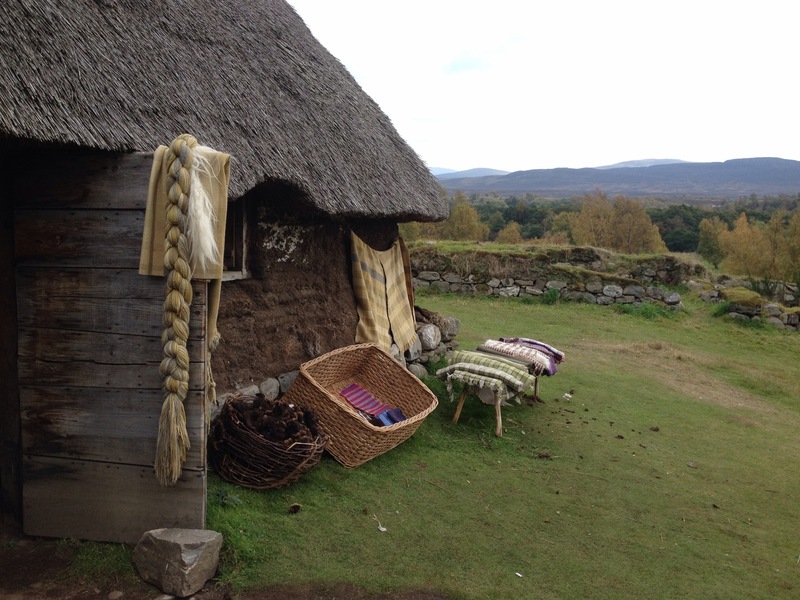 Oh, and some dressing up kit and rubber swords to do a bit of friendly family reenactment on the freshly laid turfs (Scots vs Swiss vs English) would have made it even more amazing! The site is an NTS site and so we got in free as members but if you are not a member the cost would be £8 per adult and £30 for a family.